In December 2017, the National Institute on Minority Health and Health Disparities (NIMHD) and other NIH Institutes, along with the Office of Dietary Supplements (ODS), co-hosted a workshop entitled “The Vitamin D Paradox in Black Americans: A Systems-Based Approach to Investigating Clinical Practice, Research, and Public Health.” The workshop stemmed from discussions among NIH staff from ODS, the National Institute on Aging (NIA), National Institute of Diabetes and Digestive Kidney Diseases (NIDDK), and NIMHD. The goals of the workshop were to gain greater insight into the science of vitamin D and to explore the vitamin D paradox in Black Americans. The paradox is that despite markedly low (or “deficient”) measures of vitamin D status in Black Americans, the incidence of fractures due to falls and osteopenia are significantly lower compared to White American counterparts with a similar vitamin D status. Many newspapers, scientific journals, internet sites, and social media platforms include articles about vitamin D. The articles often tout the health benefits of vitamin D or relate vitamin D deficiency to another chronic disease or condition. However, few reports explicitly explore the bone health of racial and ethnic minorities or other health disparity populations, compared to the general U.S. population. The scientific literature shows that individuals from racial and ethnic minority groups, compared to non-Hispanic Whites, are at a greater risk of being diagnosed as having deficient or insufficient levels of vitamin D. Practice guidelines recommend vitamin D supplementation ranging from 400 to 600 IU/dose to bring patients to the “sufficient” level of vitamin D needed to promote bone health. Paradoxically, research documents that despite markedly low measures of vitamin D status (deficient or insufficient), the incidence of falls, fractures, or osteopenia are significantly lower for Black Americans, compared to non-Hispanic Whites. The NIH-wide team identified and invited six diverse panelists with expertise in diverse aspects of vitamin D to engage in guided discussions for identifying knowledge gaps regarding vitamin D status and bone health in Black Americans and for providing recommendations on next steps. An overarching exploratory theme was whether vitamin D supplementations posed unintended health consequences for certain populations. Another theme was the need to develop a systems approach for understanding the various biological, genetic, and other biomedical factors impacting vitamin D levels in Black Americans. Social, environmental, and structural factors were not explored during this workshop due to time constraints and other considerations. As published in the proceeding paper, the workshop presentations revealed many contributing factors to the paradox and stimulated various recommendations. 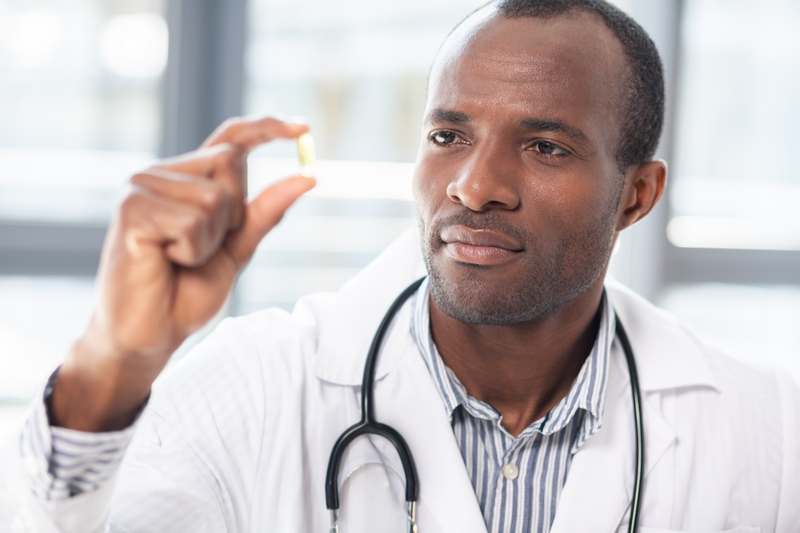 Although body fat, skin pigmentation, vitamin D-binding protein polymorphisms, and genetics all contribute to differences in 25(OH)D levels in Black vs. White Americans, not one factor alone could fully explain the vitamin D paradox in Black Americans. However, the panelists did agree that the paradox is significant and warrants further investigation. There was consensus that Black Americans gained no skeletal benefits from high doses of vitamin D supplementation and that high levels of the biomarker of vitamin D status, serum 25-hydroxyvitamin D or 25(OH)D, in this population are almost certain to result in adverse effects. Some panelists proposed that additional studies are needed so that the Institute of Medicine (IOM) can better define the safe upper limits of vitamin D intake in Black Americans and other subpopulations. Others suggested a need for better, more generalizable biomarkers of bone health to advance the science. This workshop provided fertile ground for further discussions on bone health and beyond. The call for more and better data on racial and ethnic populations, vitamin D status, bone health, and potential unintended adverse exposures was the most significant outcome of this productive workshop and justifies the need for further NIH-wide collaboration. Future discussions would benefit from moving beyond a biological focused systems-based approach to one that recognizes and embraces the complexity of minority health and health disparities, as well as the multiple social and ecological levels and domains contributing to both. A social ecological approach, as captured in the NIMHD Research Framework, may illuminate how both biological and non-biological interactions within and across multiple domains and levels, including health care systems, create or sustain the observed population level differences observed in vitamin D status. Such an approach would be expected to advance the science of minority health and heath disparities; it would also help to identify research gaps and opportunities specific to the vitamin D paradox in Black Americans and other health disparity populations. Participating NIH staff at this event included the following: LaVerne Brown, Ph.D., Office of Dietary Supplements; Giovanna Zappalà, Ph.D., M.P.H., National Institute on Aging; Padma Maruvada, Ph.D., and Mary Evans, Ph.D., National Institute of Diabetes and Digestive Kidney Diseases; and Patrice Armstrong, Ph.D., M.P.H., and Derrick C. Tabor, Ph.D., National Institute on Minority Health Disparities.